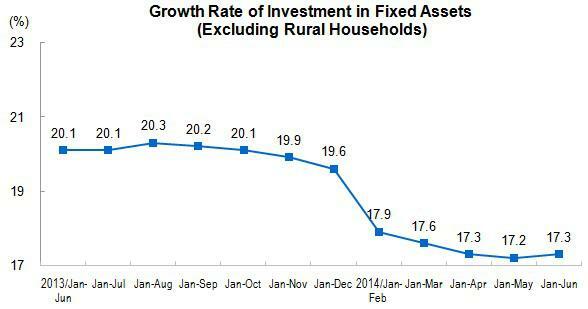 From January to June 2014, the investment in fixed assets (excluding rural households) reached 21,277.0 billion yuan, up by 17.3 percent year-on-year in nominal terms (the actual growth of 16.3 percent after deducting price factors), increased 0.1 percentage point over that in the first five months. 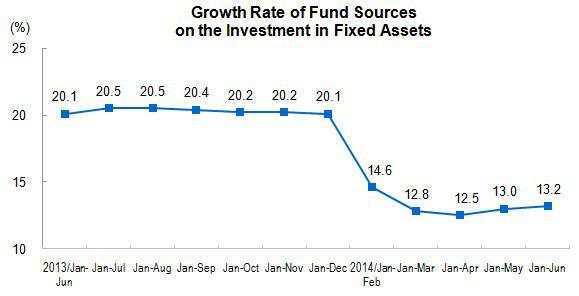 In June, the investment in fixed assets (excluding rural households) increased 1.45 percent, month-on-month. In term of different industries, from January to June, the investment in primary industry was 482.0 billion yuan, went up by 24.1 percent year-on-year, went up by 3.3 percentage points over that in the first five months; that of secondary industry was 8,918.6 billion yuan, went up by 14.3 percent, up by 0.3 percentage points; that of tertiary industry was 11,876.4 billion yuan, went up by 19.5 percent, remained at the same level over the first five months. In secondary industry, the investment in industry reached 8,747.5 billion yuan, increased 14.2 percent year-on-year, up by 0.2 percentage points. Of which, the investment in mining industry stood at 570.0 billion yuan, went up by 4.5 percent, down by 2.9 percentage points; that of manufacture, 7,264.3 billion yuan, increased 14.8 percent, up by 0.6 percentage point; that of production and supply of electric power, heat power, gas and water, 913.2 billion yuan, increased 16.2 percent, down by 0.8 percentage points. In tertiary industry, the investment in infrastructure (excluding electricity) was 3,409.4 billion yuan, increased 25.1 percent year-on-year, up by 0.1 percentage point over that in the first five months. Of which, the investment in management of water conservancy increased 34.2 percent, down by 2.2 percentage points; that of management of public facilities increased 25.5 percent, down by 0.6 percentage points; that of transport via road increased 23.5 percent, down by 0.8 percentage points; that of transport via railway increased 14.2 percent, up by 5.9 percentage points. In term of different areas, the investment in eastern region amounted to 10,092.1 billion yuan, rose by 16.3 percent year-on-year, up by 0.1 percentage point over that in the first five months; that of central region, 5,832.7 billion yuan, surged 19.2 percent, down by 0.1 percentage point; that of western region, 5,239.5 billion yuan, increased 18.6 percent, increased 0.2 percentage points. In terms of jurisdiction of project management, the central investment reached 955.4 billion yuan, increased 14.6 percent year-on-year, 5.9 percentage points higher over that in the first five months; while the local investment was 20,321.7 billion yuan, up by 17.5 percent, declined 0.1 percentage point. Analysis on projects under construction or started this year showed that, the total planned investment in projects under construction reached 73,877.1 billion yuan, up by 14.5 percent year-on-year, increased 1.3 percentage points over that in the first five months. The total planned investment in newly started projects was 19,684.3 billion yuan, up by 13.6 percent year-on-year, increased 0.9 percentage points. In terms of paid-in funds, from January to June, 24,605.1 billion yuan had been invested, rose by 13.2 percent year-on-year, 0.2 percentage points higher over that in the first five months. Of this total, the growth of government budgetary funds went up by 15.5 percent, decreased 4.2 percentage points over that in the first five months, investment from domestic loans went up by 12.9 percent, 0.6 percentage points decreased, that from self-raising funds went up by 16.7 percent, 0.6 percentage points increased, that from foreign investment decreased 8.3 percent, 2.1 percentage points decreased, other investment dropped 1.8 percent, 0.6 percentage points increased.